WOW!! What a great way to start a New Year! Fantastic score indeed! This one will be hard to beat. Will see what Uncle Barnsie can dredge up from the deeps and his heart before the deadline runs out in a couple of days. I had a similar Challenge score going, gathering over 280 inches in fish length after 8 scenes and then I hooked into a huge fish in the last scene. While fighting the fish I was distracted, turned around on my swivel chair and my mouse slipped just as the fish made another run and the line snapped. I tried for the next 15 minutes to find a fish and nothing. That would have been a very good score. I tried several times later that evening and nothing came close to that. Well, that is fishing! After checking and posting the final results after the Challenge deadline I learned that Roger will be going in for some needed medical work. Thanks Roger for your selfless support and helping with the Challenge, and here I wish you the best of luck with your procedure. Take care and come back soon! Wow: You guys are fantastic fishermen. Very Nice scores. My hat is off to all of you. This score isn't nothing to brag about but it beats my previous one. I'm now in the 3500 club. 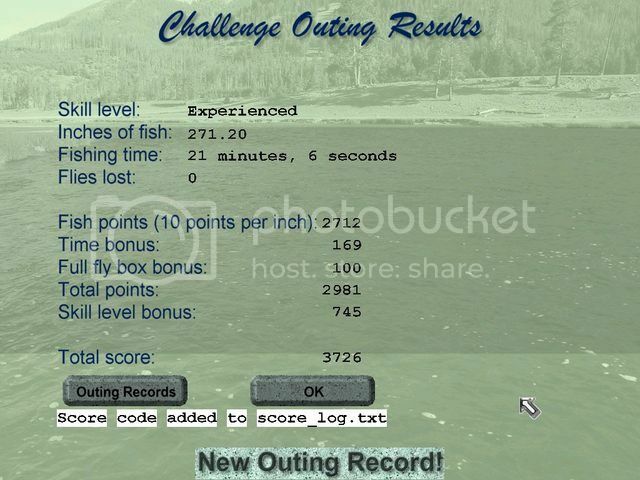 Good Score Bob, 23 1/2 hours left in challenge. Good luck to everyone. All scores have been verified and are legal to this point of challenge. Very nice last minute efforts by everyone. There is still a few more hours to go before the deadline. May the Gods of fishing shine on you during your last efforts. Jyndrek, nice Challenge score your turned in. If it wasn't wasn't for that 15 inch fish on the 8th scene you score would have been a bit higher but still a nice job! Bob, good to see you doing some fishing again. Thanks for supporting the cause and welcome to the 2500 Club! It is looking like Badger's efforts are rock solid and will be unbeatable. However, there is no telling what Barns and Roger may have up their sleeves in the waning hours of the tournament. It will be a very exciting fight to the end. Well we have 9 1/2 hours to go. Good Luck to everyone. At 6pm U.S. EST I will be on watching for scores and will keep close watch until Midnight. I have at least one or two more tries left and see what I can do. Sorry i couldn't put in a further challenge , my pc went down just before midnight on hogmany and has not returned. I have lost everything for rwff unless i can get some technical guy to get information back up and running, all links i have been told don't work for fish, this is giving me a headache as it will not allow me access to my dropbox account in windows 7 on laptop. I will be trying my utmost to get fixed. Hope someone could help anyone looking for fish for moment until i get back up and running. Congrats to Badger and all other contenders in competition, Barns will return to fight another day. performance in this McKenzie challenge. I had fun and this is what RWFF is all about. us all in line with validating scores and setting the deadline. I'll be waiting for you all in the next tournament. To all my friends on RWFF, I wish you a Healthy and Happy New Year. Now that the tournament is over with we can lean back into our easy chair and relax a little! It was pretty intense competition for a couple of weeks and a lot of fun for everyone, myself included. I wish to thank everybody for their kind words of appreciation and I am glad you enjoyed fishing the McKenzie River outing. I had lots of fun "recreating" an old RWFF Classic by Cutch, it was even more fun for me that you guys really enjoyed it and this makes all the long hours sitting in front of the computer worthwhile...as Martin can tell you. It would be meaningless to create something unless you can share it with our friends on the RWFF Forum. Thanks guys for your great support for the tournament. Without you guys we wouldn't have new fish species, new outings, or even a Forum! Those with keen eyes would have noticed I changed the GIF picture under my signature. Sign of things to come? You will see! Time to clean out that big reel of yours and get your big tackle in shape. You might have an unexpected encounter with the fabled "LOU" of the Minnesota Lakes.